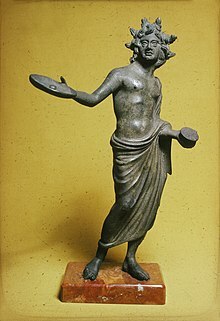 Statue of an Etruscan priest, holding a phialē from which he is to pour a libation; the plagues of Revelation are poured out on the world like offerings. The seven bowls (Greek: φιάλας, phialas, sing. φιάλη phialē; also translated as cups or vials) are a set of plagues mentioned in Revelation 16. 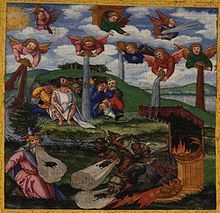 They are recorded as apocalyptic events that were seen in the vision of the Revelation of Jesus Christ, by John of Patmos. 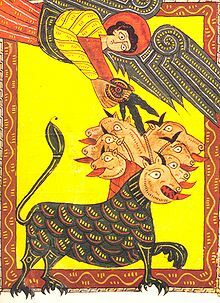 Seven angels are given seven bowls of God's wrath, each consisting of judgements full of the wrath of God. These seven bowls of God's wrath are poured out on the wicked and the followers of the Antichrist after the sounding of the seven trumpets. When the sixth bowl is poured out, the great river Euphrates dries up so that the kings of the east might cross to be prepared to battle. Three unclean spirits with the appearance of frogs come, one each, out of the mouths of the dragon, the beast, and the false prophet. These demonic spirits work Satanic miracles to gather the nations of the world to battle against the forces of good during the Battle of Armageddon. Jesus says that his coming will be like that of a thief in the night, urging his followers to stay alert. When the seventh bowl is poured out, a global earthquake causes the cities of the world to collapse. All the mountains and islands are removed from their foundations. Giant hailstones weighing nearly 100 pounds plummet onto the planet. The plagues are so severe that the wicked's hatred of God intensifies while the incorrigible continue to curse God. ^ "Bible Gateway passage: Revelation 16 - English Standard Version". Bible Gateway. ^ "Bible Gateway passage: Revelation 15:7 - English Standard Version". Bible Gateway. ^ "Bible Gateway passage: Revelation 16:1 - English Standard Version". Bible Gateway. ^ "Bible Gateway passage: Revelation 16:2 - English Standard Version". Bible Gateway. ^ "Bible Gateway passage: Revelation 16:3 - English Standard Version". Bible Gateway. ^ "Bible Gateway passage: Revelation 16:4-7 - English Standard Version". Bible Gateway. ^ "Bible Gateway passage: Revelation 16:8-9 - English Standard Version". Bible Gateway. ^ "Bible Gateway passage: Revelation 16:10-11 - English Standard Version". Bible Gateway. ^ "Bible Gateway passage: Revelation 16:12-16 - English Standard Version". Bible Gateway. ^ "Bible Gateway passage: Revelation 16:17-21 - English Standard Version". Bible Gateway.